Goes Station is a quiet community located between Xenia and Yellow Springs. A large portion of the village is located along US Route 68. Perhaps you have wondered how the town got its name. It was named in honor of William Goe who owned a considerable amount of land in that area. When the Little Miami Railroad was considering a right-of-way to connect Springfield, Xenia and Cincinnati, Mr. Goe agreed to sell a portion of the land to the railroad for a water station with the provision that the station would be named for him; hence the name Goes Station. Perhaps there was a time when it was known as Goe’s Station, but most history shows the name Goes. The first business in the community was a scythe factory, but it did not continue long. After the factory closed, about 1846 Alvin and Lorenzo Austin established a powder mill on the site of the old factory. The nearby Little Miami River provided the water power necessary to operate the mill. The factory later was sold to Joseph Warren King who operated it for many years. Many of the houses and businesses were established for the benefit of the workers. Those who worked in the mill were paid well, due to the fact that the job was perilous at times. It has been said that the men who worked there were a rough lot. There were no taverns in Goes so they would take the Springfield and Xenia Electric Railway into Xenia, spending a considerable amount of their salaries on liquor. The men working at the mill usually earned two to three times the salary of the average worker. By 1862, there was a post office, general store and a train station. In the 1890s business at the mill was booming. There were about 35 families living in the village plus 20 to 30 single men in the company boarding houses. The school provided an education for the children of the workers. J.F. Shoemaker managed the general store, J. Hamilton was the shoemaker and the blacksmith was L.O. Reinhardt. Residents were pleased when attorney George H. Keyes hung out his shingle. The Xenia Gazette even provided an agent for the village. J.H. Jacoby owned the flour mill known as Practical Millers, Flour, Bran and Feed. As was usual in many communities, the man who ran the general store was also the postmaster. When there was a mix-up in the mail because another hamlet in Ohio had a similar name, the postmaster took it upon himself to change the name to Goes. J.W. King sold his interest in the powder mill to Aetna Powder Company of Illinois. Aetna sold the mill to Hercules Powder Company. The business was eventually phased out and so changes came to the village. The gun powder mill was often a dangerous place to work. Several major explosions were recorded with considerable loss of lives. The pay was good, however, and those who were willing to take the risks were well compensated. When the powder mill closed for good, the village suffered a loss. The school was closed and the children were taken by bus to the Xenia Township Schools. The Post Master lost his job when the mail began to be delivered and routed through the Yellow Springs Post Office. Goes was way ahead of its time when it came to running water inside a home. The people in the village had no wells, but they did not need them. Water was supplied by a few springs near the top of the hill. The water was caught in a bucket and then through a series of pipes which by use of gravity brought the water down to the folks in the village. Due to the nature of the spring and the pipes bringing the water to the homes, water was available all day and night. Most folks had a sink in the kitchen along with a drain for disposing of the waste water, but there was no way to shut off the flow. The water was quite hard, as it is through most of the county even today, but it was always cool and refreshing. Residents who did not want the water piped directly into the house could choose the alternative of providing a cement spring box placed hear the house into which the water would flow. A spring house was constructed near the grocery. This was ample to keep milk, butter and other perishables “refrigerated.” On a hot summer day a watermelon cooling in the spring water would have been a treat. At the general store folks would often sit outside on a warm day, exchanging news and gossip. In the store oats, corn meal, beans and sugar were kept in bins. A candy case was a special part of the store where one could secure a cup full of candy corn for a penny. If you preferred you could purchase a tin of ice cream candy with a tiny spoon for five cents. Licorice, caramels, chocolate creams, horehound stick and cinnamon drops were also available. Tobacco was sold in plugs, wrapped in tin foil. The children might be given the tin foil to play with after grandfather took out the tobacco. When the powder mills went out of business, E.H. Hunt and his wife bought about 500 acres of land. They cleared he woods, tiled the fields and built roadways through the property. They raised sheep and White-faced Herford cattle. They utilized the buildings remaining from the old mill for animal shelters. Later the property was sold to W.A. Hammond. The log home of James and Rebecca Galloway had originally been constructed on this property. The Greene County Historical Society acquired the home and moved to property in Xenia in 1936. The historic home remains a part of the museum complex. 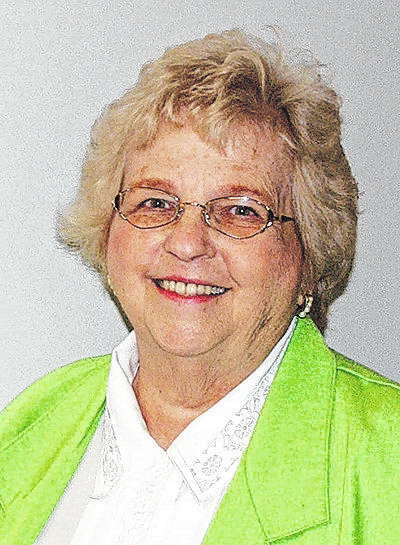 Joan Baxter is a resident and long-time historical columnist.